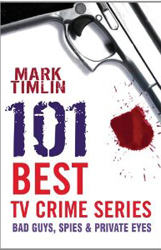 Mark Timlin shares his favourite 101 crime TV shows in his first list book. Covering classics such as Z-Cars to more recent shows like Luther, there is definitely something for every crime show fan. As the book is guaranteed to start debate you can share your favourite crime tv series by joining the debate on the accompanying website for the 101 Crime Series book at http://www.crimeseries.tv.